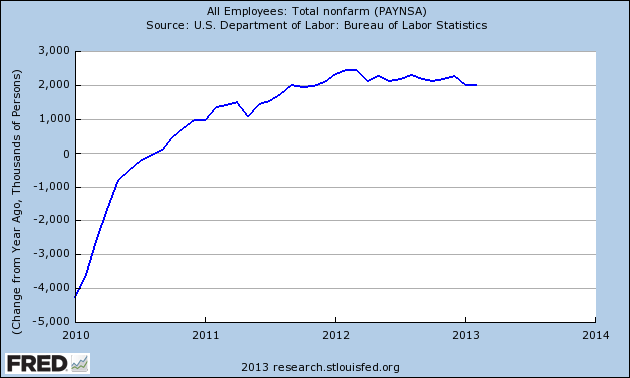 Look at the jobs report to see how America has changed, and continues to change. Summary: The news media coverage has expanded during the past 20 years, but probably only giving more heat than light. Hence the frequent assertions during 2010-2011 (eg, seen in the comments on the FM website) that we were in a recession — or even a depression. On the other end of the daft spectrum, we have the repeated forecasts since summer 2009 of the boom coming this year. After proving false, forecasters have settled on a target date of next year (ie, 2014). In fact, as many have pointed out — from Paul Krugman to articles on the FM website — the America economy has been slowly expanding, fueled by extreme monetary and fiscal stimulus. Accompanying this has been structural change of a grim sort. This post gives a quick review of these three perspectives, as seen in the jobs numbers. 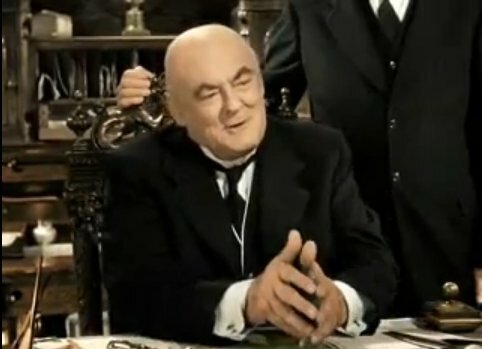 Mr Potter hated the New Deal. Now a happy man! Jobs is short word, but — like most macro-economic variables — is complex to measure and interpret. So let’s look at the job picture from several different perspectives. In brief: the recovery was slow, and appears to be slowing (decelerating) as the fiscal stimulus fades and each new wave of the Fed’s conventional and now unconventional monetary stimulus measures has less effect than the previous wave. Most of these graphs show non-seasonally adjusted 12 month numbers (totals or year-over-year changes). This washes out much of the noise, but with lower resolution (ie, obscuring any recent trend changes). This graph shows the trailing 12-month total job growth of non-farm jobs. It peaked in February 2012, and has gently slowed (decelerated) since then. Let’s give some perspective on that by looking at the the past 40 year history of this metric. The graph below shows that job growth has slowed since early 1980s (In this, as in most economic metrics, there was no “Reagan Miracle”; details here). This peak in growth is at the same level as the peak in the (slower) recovery from the 2000 crash. The difference is that the fiscal and monetary stimulus in this cycle dwarfs that the early 2000s. 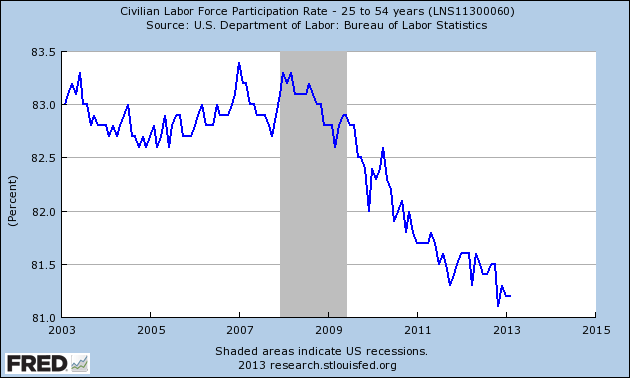 How much of the US population is in the labor force? That is, the fraction of the population who are either working or unemployed. Looking at the participation rate accounts for people entering and leaving the labor force: children growing up, immigrants, those retiring — and the unemployed who have given up looking for a job. This graph shows the participation rate for civilians between the age of 25 and 54, and so ignores the effect of boomers aging into disability and retirement. It measures how much of America’s greatest resource being used. Do you see any recovery? The real deficit: the increase in the Federal public debt (for 12 months ending in February). Total $5.243 trillion. 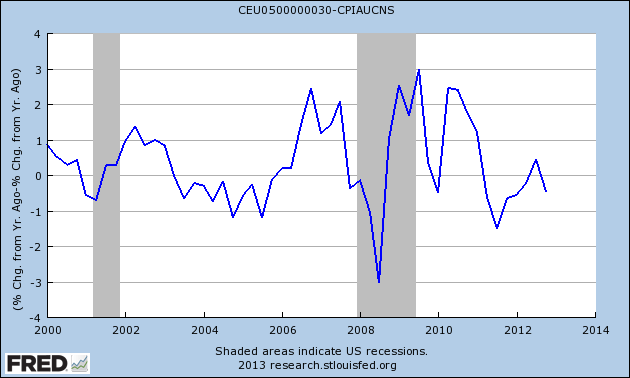 The price of the slow growth after the recession. The fiscal stimulus has decreased each year (by this metric). Unfortunately the effects are gone with last year’s snow. We could have spent twice as much and rebuilt much of America’s infrastructure, kick-starting the economy with projects preparing for prosperity in the 21st century. Instead we frittered away much of it on foreign wars and miscellany. The job market shows many important aspects of the evolution of the America-that-once-was into the New America. (a) How much are people earning for their work? Here is one measure of this key variable: the annual (12 months) change in the average Real Weekly Earnings in the private sector of Production and Nonsupervisory Employees (ie, the nominal change minus the CPI). The total change over the past ten years: 1%. 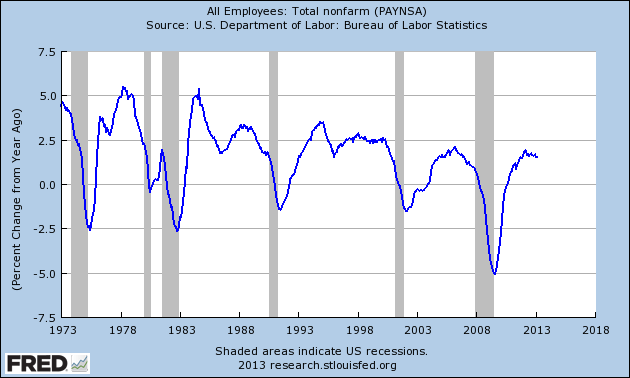 This stagnation in real wages didn’t just happen. The first wave to depress wages was the long campaign by corporations to convert the Federal government back to its traditional role in American history of a anti-worker force (since the precedent in 1834, Jackson’s use of troops to surpress workers building Chesapeake and Ohio Canal; see page 10). This required gutting the New Deal’s pro-labor laws and enforcement agencies. In the past twenty years we’ve seen the results of the second wave: converting secure full-time jobs (with health care and retirement benefits) into jobs that are some combination of temporary, no-benefits, part-time jobs. Companies like Wal-Mart and Amazon have become models of the new corporation, destroying the middle class that was both the major accomplishment and foundation of the America-that-once-was. 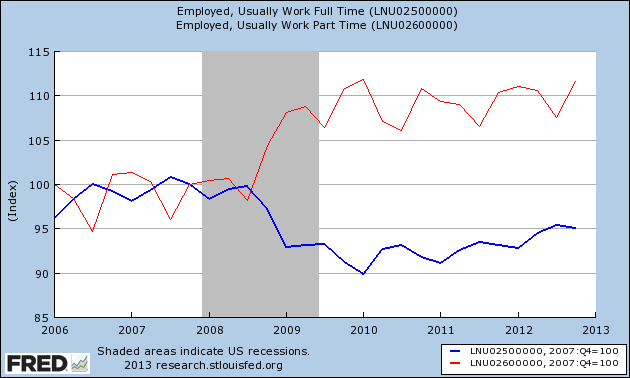 The following graph shows indexes of the numbers of people who usually work part-time (red) and usually work full-time (blue) jobs, with Q4 of 2007 (start of the recession) = 100. This counts people, not jobs (see this graph of people who work more than one job). Since the recession began the number of people who work full-time has dropped by 5.8 million (to 166 million); the number who work part-time has increased by 2.8 million (to 28 million). Welcome to the New America, with the insecure working class so loved by employers. On this important date let’s remember the past and look forward to our future, 2 March 2013 — We’re losing. We will continue to lose until we see this.